Compost is one of the most nutrient-rich and easily used products for your cannabis plants. It is also really simple to make with a little effort. All you need is some time and some scraps of organic waste. We'll explain how to make and store your compost to suit your needs, and also how to use it correctly with your cannabis plants. Compost is a nutrient-rich organic fertiliser that is produced as a result of the decomposition of organic material that exists in a semi-solid or solid state. In layman's terms, organic material or waste products are being recycled and turned into food for your soil and plants. There are several micro-organisms that can help to create a product that is perfectly digestible for your cannabis plant. In this guide, we will give you an overview of what it takes to make and use your own compost! Compost is usually bought in various forms, but the process it undergoes isn't always entirely natural. When compost is homemade, you can ensure you budding green beauties get all natural food. You also obtain the luxury of becoming more sustainable by using your own household organic waste. • Compost enhances the development of organoleptic properties in cannabis plants using a 100% organic process. • It provides trace elements of micro and macronutrients, reducing the need for additional fertilisers. • Compost protects the soil, which helps to reduce weed growth and protects beneficial bacterial life. • Creates a greater level of water retention in areas suffering from water stress, such as guerrilla grows. • Offers a rich nutritional profile to feed and nourish cannabis plants! • Promotes the population of earthworms, further enhancing the soil with vermicompost. • Provides organic soil recovery, improving soil health and diversifying bacterial life. Using this type of composter helps to avoid the issue of rodents and pests attracted to waste. They are built out of plastic with a lid at the top to insert waste, which allows for a fast and convenient process, making it ideal for home use. It's basically just a bin with a door at the bottom where you collect the mature compost. If you have a spare drum or barrel, then you have a composter. You only have to make some holes to start composting. A door at the bottom should be made in order to access the compost. An old steel drum or barrel can be used as a composter if you poke some holes in the bottom to make a door and keep a lid on it the same way that you would with a commercial composter. If you can rustle together the materials and find some spare time you will be graced with an amazing compost bin. This kind of composter should have a top door and a front with wooden boards for easy removal and effective maintenance. A simple sheet of wire mesh can be converted into a composter in a few minutes— you only have to join the ends and secure it to the ground. This type of composter allows for good ventilation, so you must watch humidity and temperature to ensure that the decomposition process doesn’t stop. This compost bin is ideal for decomposing garden waste. You will need to be close to a water supply so that it is easy enough to turn the compost and extract waste. The best way to learn this method is to keep trying until you master the design to suit your requirements, just be sure to keep an open mind if any problems occur! It will take at least four months to get your compost ripe, so the best time to start is as soon as possible. Follow these easy directions, and you should get enough compost to keep you going. Even before you have chosen which type of composter you are going to use, you can start foraging for organic waste. You can put a container in your kitchen to collect it up before throwing it onto your compost heap. 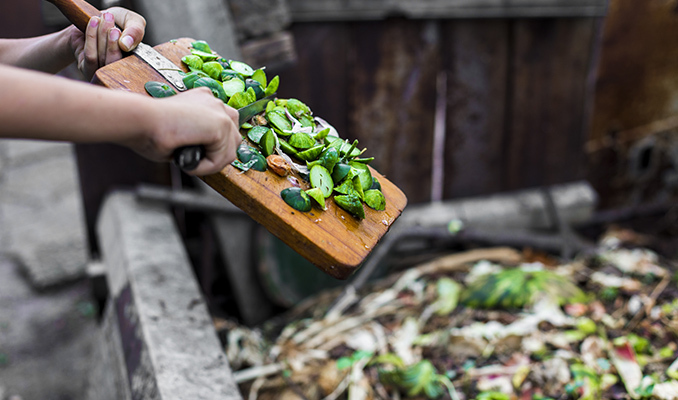 Try and find some good organic waste from outside your kitchen as well, this will help to get the ratio just right. Most stuff you can find on the forest floor works fine, dry leaves are probably the best to use and easy to get hold of. Break up as much of the waste before it goes onto your compost heap so that it turns into compost faster (no more than 5cm cubes) and be sure to turn the heap over once a week. The compost heap needs plenty of fresh air to let the microbial life breathe. If you're using a tarpaulin cover, use a shovel or turn your compost by hand. If or when your compost looks like it is drying out, fill up an old milk bottle or jug with water and allow it to sit for 24 hours. This will allow the chlorine in the water to evaporate, which is essential in order to protect the vital microbial life. You don't need to add the entire jug, just enough so that it keeps the mixture slightly moist like a wrung-out sponge. A second chamber or composter can be very beneficial as it will help you to turn your old compost into black compost. This works by separating the old compost from the fresh scraps which will prevent the decomposition process from being stunted by fresh waste. The ideal consistency you are looking for in your compost is like a clumpy black soil. You should be able to spot eggshells and a few fruit pits, but this is absolutely fine as you can pull them out wearing some old dishwashing gloves. As long as there isn't a bad smell resembling rotting fruit or vegetables, then you should have some excellent compost. A good balance for cannabis plants is one part compost for every three parts of soil. For long season outdoor crops, it can also be a good idea to make an additional application of compost during the final transplant if the compost is mature enough. You can apply a very fresh and ripe layer of compost to the surface area of your soil which will help to reduce weed growth that can stunt your cannabis plants' growth. This will also help to fertilise the soil and reduce solar radiation that can kill the bacterial life in the soil. You can perform a leachate of compost by creating a liquid that is rich in organic fertiliser known as 'compost tea'. Fill a cloth bag with about a kilo of compost and add it to a bucket filled with water. Allow it to soak for about 12 hours and then it will be ready to water directly. When the compost tea has been soaking for more than 12 hours, the mixture should be diluted with water before it is applied to your plants. It won't require a lot of work. Beneficial micro-organisms will do most of it for you, but be sure to follow some simple steps to get the most out of your valued compost. • Balance out the contents by thinking about the quantity of various material in your compost. The compost heap should be comprised of 25–50% green material, with the remainder being brown material. Your compost will be ready to use after a period of between 6 months and 2 years. Although this is indeed a long time, your cannabis crop will thank you for the dedication. They will certainly return the favour in the form of large yields and potent flowers.